The proceeds of this race go toward maintenance of the trail by the Freeport Running Boosters. Proceeds from this event will be donated to UPHill Journeys at Maine Medical Center in Renee's memory to support patients who have pulmonary hypertension and who also experience transplant-related and other financial expenses. Spring is just a few days away. Time to forget the snow and the cold. Come join us in support of Children's Dyslexia Center of Portland. This is a challenging course in the Freeport area. Donate to help maintain the Freeport Running Booster's trail. This course is used by the cross country team to train and use as their home course race trail. 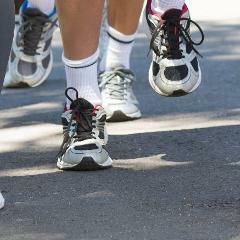 Join us for the annual run on Bow Street Markets 5K run. Proceeds to benefit the Freeport Running Boosters. The Bobcat 5K is a fundraising effort by the Stowe Community Group to further enhance our children’s education and experience at the Harriet Beecher Stowe Elementary School in Brunswick, Maine. Support our local youth and launch your Spring fitness with a rockin' 13.1 mile run from Portland to Freeport along the shores of Casco Bay. Run as an individual or a relay team. Renee Brodeur was diagnosed with pulmonary hypertension in 2010. She received a double lung transplant in June of 2011. After a valiant journey, Renee lost her battle in April of 2012. The Annual Spring Into Action 5K and Fun Run race. The proceeds for this race will benefit the Marshwood High School Softball Program. Support the CE High School, Middle School and Pond Cove Parents' Associations. Alewives 5K and 10K races to benefit the Damariscotta Mills Fish Ladder Restoration. The Run for Independence is a community event focused on celebrating ability while raising awareness and encouraging inclusivity. Proceeds will support Independence Association programs for individuals with Intellectual Disabilities. Project Graduation is a program offered through Windham High School, in which organized, adult-supervised and alcohol-free activities are offered as part of a post-graduation party, as an alternative to student-run events. End Domestic Violence...Be Part of the Solution! Annual Amy, Coty, Monica Memorial 5K Run/Walk on Saturday, June 3, 2017 at 8:00 a.m. at Dexter Regional High School.